If you're concerned about the patients she's not treating, don't be too worried. All the chapters in the book are very short, so it will never take too long to find a good stopping place if somebody needs to get defibrillated or whatever. Or maybe she is reading it out loud during surgery to lighten things up a bit and lower everybody's blood pressure. Basically, there are probably lots of important medical uses for this book, is what I'm saying. Keith, by the way, has written an excellent book called The Marble and the Sculptor, which is about adjusting to the practice of law. You should buy it if you are doing that or know someone who is. This is not just logrolling. It's really good. 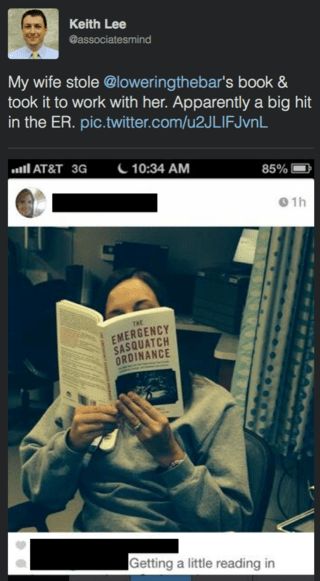 Medical personnel and other non-lawyers should continue to bathe in the healing radiance of The Emergency Sasquatch Ordinance, of course, but law students and new lawyers should also get Keith's book.